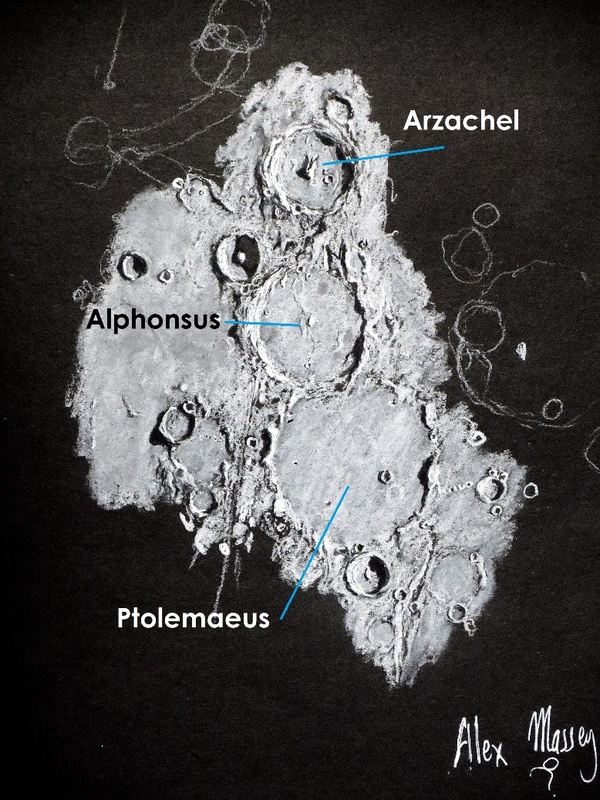 Ptolemaeus, Alphonsus, and Arzachel… the names of three massive, interlocking craters on the Moon. These three craters tell the story of the ancient Moon’s creation and evolution. It’s a story of violent bombardments and oceans of lava. We can use light and shadows to reveal the shapes and deep history of these features. Most people think of astronomy a science of light. But, light creates shadows when it hits things. Those features that lie in the shadows, the dark parts and seemingly just-in-the-way-of-the-light parts, are just as important as those that shine brightly. These dark shadows form most of the mass of all galaxies, house stellar nurseries, reveal old lava rivers on the Moon, and create curious plays of light and dark. These can play tricks on our eyes and make patterns appear. Shadows hide stories in their inkiness. I have sketched at the eyepiece many of these dark shapes, and while shadows might just seem to get in the way, in reality they give shape to the light. Our closest neighbour, the Moon, holds many secrets that lie in the shadows. As the Sun rises over the lunar horizon, it casts shadows that tell stories that are billions of years old. The lunar surface is a layered pattern – a palimpsest – that we can learn to interpret. The Sun rises and sets across the Moon’s surface. Over the course of a month on Earth, we see this as the phases of the Moon. The “terminator” on the Moon is the boundary of those phases. It marks the transition from dark to light. Exploring the terminator, even with a small telescope, allows you to discover many of the Moon’s secrets. Even with a modest telescope, you can see a lace-like network of fine lines or cracks that resemble crazing (as seen in some glazing of pottery). It is only while the Sun is shining at a very shallow angle that these typically shallow lines show themselves. Yet the origins of these fine lines is quite varied. Four billion years ago when the Moon was very young, its interior was very hot and molten. Its surface had a thin crust. In many ways just like the Earth today, but without the atmosphere and oceans of water. The thin crust was easily pierced by large asteroids, allowing molten lava to pour into and flood the crater. When the Moon was young and very hot, these craters always totally filled in with lava. Move to three and a half billion years ago, the Moon cooled, the crust got thicker, and it was both harder for large asteroids to pierce through the crust and lava filled in less of the crater. Eventually, three billion years ago, the Moon cooled to the point where lava no longer flowed, and impact craters no longer filled with lava. We can see the ages of the craters by understanding what the shadows cast across them mean; their morphology reveals their history. Let’s go for a walk on the Moon. We can’t yet visit there ourselves but we can tour the moon’s surface with our eyes. The trip will take us to the 3 craters we mentioned earlier. We can see the Moon’s age timeline in the prominent trio of craters Ptolemaeus, Alphonsus and Arzachel. Ptolemaeus (2900 meters deep from rim to floor) is the oldest of the trio, being so filled in by lava it is almost a ghost crater. Alphonsus (3200 meters deep) formed many millions of years later, with the flooding lava nearly totally swamping the central peak. Arzachel (3950 meters deep) formed with very little flooding, with most of the central peak still exposed. Surrounding smaller craters have no flooded floor. While many people are aware of lava flows being present on the Moon, many again don’t realise that if there was once lava, there must have once been volcanoes! And many of the volcanic features that we see on our terrestrial volcanoes can also be seen on the Moon: shield volcanoes, pyroclastic deposits, collapsed lava tubes, and old lava rivers. All of these are revealed by understanding what the shadows are telling us. These features are invisible when the Sun is high in lunar sky when no shadows can be seen. The shadows reveal their shapes. Possibly the largest shield volcano on the Moon lies right beside one of the brightest features. The brilliant young crater Aristarchus sits right beside the winding, 10km wide Vallis Schroteri. This “valley” is actually a very ancient and wide dry lava river. The head of this valley has the nickname of “the Cobra Head”. The Cobra Head is a massive shield volcano from which much of the surround lava fields poured out. Curiously, there is a much smaller lava river that trickles down the middle of Vallis Schroteri, a much younger and much smaller lava river. Vallis Schroteri peters out into Oceanus Procellarum, the Ocean of Storms. The most famous shield volcanoes here on Earth are Hawaii’s Mauna Loa and Kilauea volcanoes. Their lava rivers can be found pouring molten red from their massive calderas. Our imagination is wild. Our mind instinctively sees patterns in what would otherwise be visual noise or chaos. This phenomena is called apopheia or patternicity. In the chaotic and rugged surface of the Moon, shadows play tricks on our human minds. And from the shadows we see animals, trees, faces, even letters of the alphabet, numbers, maps and other symbols. All of these features are also only visible for just a couple of hours as then the shadows change so much that these patterns are no longer visible. The Lunar X is one such feature, created when the shallow Sun illuminates only the very rim of three craters that are near each other. An owl’s face can be seen formed out of two craters, and a little fat owl is formed out of three craters. The terrifying forces that create craters also results in damage occurring to existing craters. This damage also results in shadows that form creating patterns that are nothing less than remarkable in their resemblance to some very terrestrial features, such as a map of Australia. Shadows show the shapes of things. 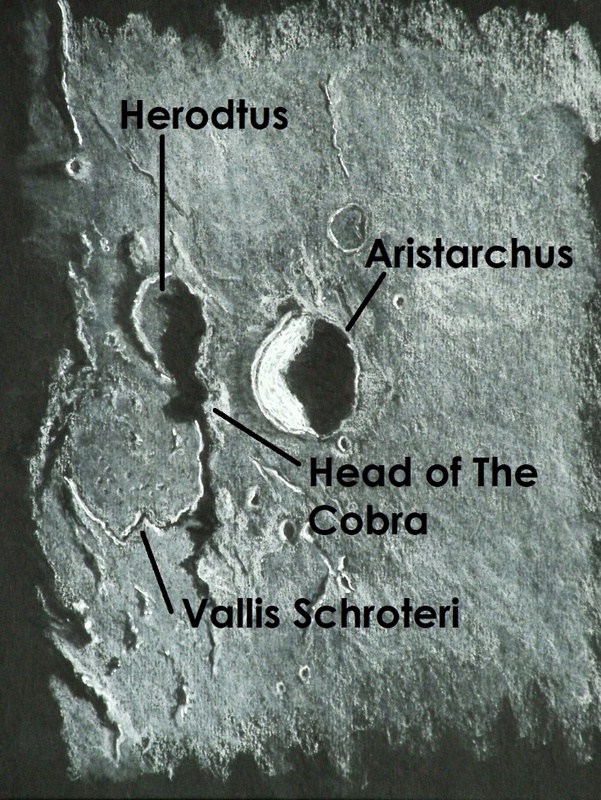 In this article we toured some of the Moon’s features that are revealed by looking at shadows. In the second article on shadows we’ll explore Deep Space Objects. Please visit Alexander Massey’s incredible blog to see his expanding collection of astrosketches. Also, Alex is based in Australia – and sees the Moon “upside down” from the way northern hemisphere viewers see it! Have a look at this Arizona State University moon survey map tool for the three craters that Alex drew from his eyepiece. Compare the two views. You can see that the map is biased toward the northern hemisphere – every moon map I have ever seen is rendered from a northern hemisphere orientation.